Jewish history has not always been characterized by laughter, but in Genesis it evokes the freedom and joy of a life in partnership with God. Last week’s Torah reading of Lekh-L’kha (Genesis 12-17) tells the story of the birth of Abraham’s elder son Ishmael. By contrast, this week’s reading of Vayera (Genesis 18-22) has at its center the birth of his younger son Isaac. I say “by contrast” because, from the very start, beginning with the circumstances of their birth and their respective names, the text makes the difference between the two boys especially stark. Nor are these differences just a matter of literary curiosity; rather, they present divergent ways of relating to God. Read the rest at Mosaic Magazine. Avraham’s defining trait in the midrash, and to a certain extent in the text of the Torah itself, is the trait of hospitality. When the three emissaries of God appear to him by the terebinths of Mamre, we hear in detail how he and Sarah rush to make them feel at home. Avraham invites his guests to “lean and loafe” beneath a tree. 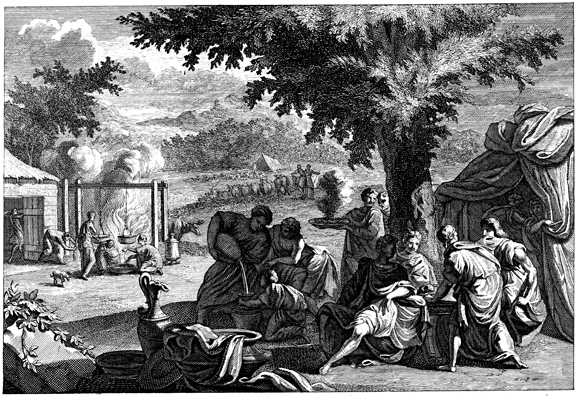 The midrash is reported to say that the tent of Avraham was open on all four sides so that he and Sarah could welcome guests approaching from any direction. It is striking that Avraham of all people is defined by this trait of openness given that a crucial element of his legacy was shutting the doors on pagan worship and establishing an exclusive covenant with God. Later on in Parshat Vayeira, his nephew Lot echoes Avraham’s spirit of openness when he welcomes two of the emissaries and also treats them with generosity. However, Lot’s openness soon turns into an ugly distortion as we see that in Sodom “hospitality” necessarily involves exploitation and taking advantage of others.